India's Position on Israel and Palestine: Change or No Change? Much is being made of India’s decision to abstain on a recent UN HRC vote on the 2014 Gaza Conflict. Is it justified? India was one of five countries–the others being Kenya, Ethiopia, Paraguay, and Macedonia–to abstain on a UN Human Rights Council (HRC) vote on July 3 adopting the Report of the Independent Commission of Inquiry on the 2014 Gaza Conflict. The report largely condemns Israel’s actions during last year’s Operation Protective Edge, a seven-week-ling military operation by Israel into the Hamas-controlled Gaza Strip. 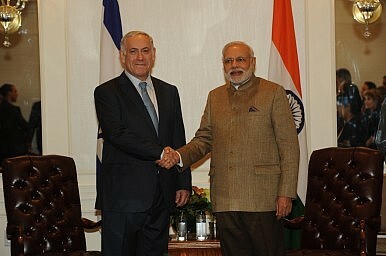 The Indian vote is being seen as emblematic of the ongoing rapprochement between the governments of India and Israel. India’s new government, led by Prime Minister Narendra Modi and the right-wing Bharatiya Janata Party (BJP), is partly recalibrating New Delhi’s approach toward Israel, development that will no doubt be welcome by Israeli Prime Minister Benjamin Netanyahu. 41 HRC members voted in favor of the resolution and the sole vote against came from the United States, Israel’s traditional ally and supporter at the United Nations. As I’ve written in The Diplomat before, Israel has climbed its way up New Delhi’s diplomatic agenda since Narendra Modi came to office in May 2014. Modi will become the first Indian prime minister to travel to Israel since the two countries established diplomatic ties in 1992. An Indian “rapprochement” with Israel, however, traces its origins to before Modi’s ascendance. As Nicolas Blarel also recalled in The Diplomat, India’s previous BJP-led government, which was in power from 1999 to 2004, was similarly seen to have initiated a recalibration of New Delhi’s policy toward Israel. Israeli Prime Minister Ariel Sharon’s landmark visit to Delhi in 2003 appeared to represent a sharp turn in New Delhi, but that momentum was short lived. Afterward, India’s Congress-led United Progressive Alliance (UPA) government maintained close ties with Israel–certainly as an important defense partner–without considerably showing support for Israel in the Arab-Israeli policy. Vikas Swarup, the spokesperson for the Indian Ministry of External Affairs, wanted to make sure that this vote wouldn’t be over analyzed in the context of Modi’s upcoming trip to Israel and other developments. To this end, he noted that ”There is no change in India’s long standing position on support to the Palestinian cause.” He claimed that the Indian abstention was spurred by the resolution’s reference to the International Criminal Court (ICC), the international court of arbitration that was established by the 1998 Rome Statute. India is a non-state party and non-signatory. Swarup noted that India had similarly pursued a “general approach” of abstaining in the past when HRC resolutions referenced in the ICC on resolutions involved Syria and North Korea. “We have followed the same principle in our voting on today’s Resolution,” he added. My understanding of the MEA position is that it is our normal practice to abstain when a resolution invokes the International Criminal Court (ICC), and that in this case too, that was done. In other words, MEA says the abstention had nothing to do with the merits of the resolution and does not reflect a changed stand on the Israel-Palestine question. Personally I will take MEA’s word for it while stressing that India’s consistent and moral position on the substantive issue must not be diluted. There is a national consensus on Palestine which I would urge the government to continue to respect. So what happened to the Indians? The answer is pretty simple; Prime Minister Narendra Modi, who assumed office in April 2014, has led a strengthening of ties with Israel. Diplomatic officials in Israel say that India’s change in stance, which came to fruition in the UN vote, mirrors a warming of relations between the prime ministers and represents a change in position on counter-terrorism, within the rising super power. Indian sources, meanwhile, reported that Netanyahu had personally reached out to Modi before the HRC vote and implored India to abstain from voting on the resolution (reportedly, he also did this for leaders in Kenya, Ethiopia, Paraguay, and Macedonia). Neither the Indian foreign ministry nor the prime minister’s office verified reports that Netanyahu had called Modi. If, as Swarup notes, India voted as per its standard policy regarding the ICC, then a call from Netanyahu asking India to abide by its own diplomatic principles would have been redundant. Modi and Netanyahu are known to have a close personal rapport since they met for the first time on the sidelines of the 2014 United Nations General Assembly in New York. After the vote, Israel’s ambassador to India, Daniel Carmon, thanked India for the abstention: “We appreciate votes by members of @UN_HRC ,including #India, who did not support yet another anti Israel bashing resolution.We thank them,” he noted on Twitter. With Modi’s impending visit to Israel and a positive bilateral outlook across a range of areas of cooperation, including on defense and trade, it’s unmistakable that India’s relationship with Israel is growing in importance. India’s recent HRC vote, however, shouldn’t be read as the start of a long-term trend on how India views the Arab-Israeli conflict. What most analysis in both Israel and India has failed to adequately highlight in the wake of this HRC vote is the extent to which India needs to concomitantly manage its relationship with Israel and Arab states. For reasons of energy security and other strategic considerations, India cannot afford to deepen its ties with Israel at the expense of its position in the Middle East. We’ll know more about where India stands after Modi’s visit later this year. Why the BJP’s love of Israel will do little to change India’s foreign policy.